Heads-up: I get commissions for purchases made through links in this post. Fat Dragon Games provide papercraft for your gaming needs. This week only there is a PWYW-sale (until Jul 10th). Go HERE. 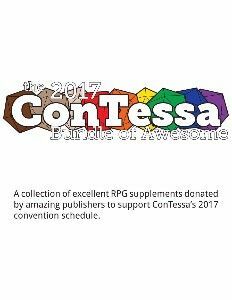 And don't forget the 2017 ConTessa Bundle of Awesome. It runs till Jul 11th. For USD $10 you'll get a fast collection of incredible games (mostly OSR-style). Hollowpoint: wonderful indie (non-OSR game) where everything gets fucked up at some point. I played it several times and it was great fun. One of my favorite games.